Let’s start by stating the obvious: Hillary Rodham Clinton would be a formidable presidential candidate in 2016. Mrs. Clinton’s credentials as secretary of state, as a United States senator and as a politically engaged first lady would be hard for any of her Democratic or Republican rivals to match. She would have little trouble raising funds or garnering support from the Democratic officials, and she might even come close to clearing the Democratic field of serious opposition. Mrs. Clinton made some tactical errors during the 2008 campaign — particularly, in her staff’s failure to understand the importance of contesting caucus states. But she improved considerably as a candidate over the course of the long primary, and the experience she gained would undoubtedly help her if she were to run again. Over the course of her long career, the public’s views of Mrs. Clinton have shifted along with her public role. When she has been actively engaged in the hand-to-hand combat that characterizes election campaigns and battles in Congress, her favorability ratings have taken a hit, only to recover later. In the chart below, I’ve taken a moving average of Mrs. Clinton’s favorable and unfavorable ratings dating back to 1992. (The average is based on the 10 surveys that were conducted closest to the given date). The chart also highlights some of the most important moments of Mrs. Clinton’s career. But Mrs. Clinton took a far more active role in seeking to affect public policy than most first ladies. In September 1993, she appeared before Congressional committees in an effort to advance the health care bill that she and Mr. Clinton had helped to design. No longer subject to the deference that first ladies typically receive from politicians and from the news media — and associated with a health care bill that would soon die in Congress — Mrs. Clinton saw her unfavorable ratings rise sharply, increasing to about 35 percent. Adding to the pressure was the Whitewater investigation. In April 1994, Mrs. Clinton gave an unusual news conference in an effort to respond to her critics. The next two years were among the most difficult periods in Mrs. Clinton’s career, with her favorable ratings often barely exceeding her unfavorable ones. 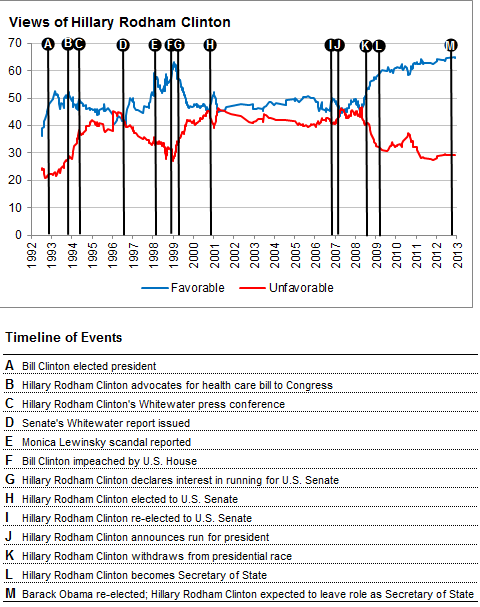 During stretches of early 1996, more Americans viewed Mrs. Clinton negatively than positively. The release of the Senate Whitewater committee’s report in June 1996, which largely lacked substantive proof of wrongdoing by Mr. or Mrs. Clinton, seemed to help relieve the strain on her popularity, with Mrs. Clinton’s favorability ratings increasing, and her unfavorable ratings declining, throughout 1997. Another set of accusations, which would become the Monica Lewinsky scandal, would work to Mrs. Clinton’s benefit, with her favorability ratings reaching a new high of about 60 percent after the impeachment of Mr. Clinton by the House of Representatives. But Mrs. Clinton’s favorability ratings declined sharply in early 1999, after she declared her interest in running for the United States Senate, again making herself an explicitly political figure. After a brief “bounce”in her favorability ratings following her election to the Senate from New York in November 2000, Mrs. Clinton’s image entered into a long period of relative stability, with her favorable ratings averaging just below 50 percent, and her unfavorable ratings just above 40 percent, for most of the next six years. Mrs. Clinton’s popularity would come under further pressure when she pursued her next ambition, announcing her candidacy for the presidency in January 2007. Over much of the next 18 months, as she came under increasing scrutiny from Barack Obama and other Democrats along with Republicans, her favorable and unfavorable ratings ran even with one another at about 45 percent. Then Mrs. Clinton received a further boost after accepting the job as Mr. Obama’s secretary of state. Her favorability ratings have been stable — and strong — throughout most of Mr. Obama’s first term, with 60 or 65 percent of Americans taking a favorable view of her against 30 percent who have a negative one. What is the moral of the story — other than that Mrs. Clinton has had a remarkably interesting political career? The theme is that a politician’s favorability ratings are a function, to a large degree, of the extent to which the other political party, and perhaps also the news media, feels as though they have license to criticize her. During her tenure as first lady, Mrs. Clinton’s favorability ratings were lower when she was more actively engaged in policy making, as she was during the negotiations on the health care bill. And her popularity came under more strain during the Whitewater allegations, in which she was implicated, than during the ones involving Ms. Lewinsky and Mr. Clinton. gn, when she came under intense scrutiny not only from Republicans, but also from her fellow Democrats. The surge in Mrs. Clinton’s favorability ratings late in the 2008 campaign, although perhaps partly testifying to her steadily improving skills as a campaigner and to her new role as an underdog in the Democratic primary race, may also have reflected the fact that Republicans had less incentive to criticize her. Instead, they were trying to woo her supporters — or bolster her chances to prolong the Democratic nomination process. Mrs. Clinton has been highly popular as secretary of state, but so were her predecessors during George W. Bush’s administration, Colin L. Powell and (to a slightly lesser extent) Condoleezza Rice. None of this is to argue that Mrs. Clinton would not have some unique strengths as a candidate. For all the reasons I mentioned at the top, she seems like Democrats’ best bet, perhaps by some margin, to extend their winning streak to three or more terms in the White House. If she ran even a point or two stronger than a “generic” Democrat, the odds would shift meaningfully in her favor, holding other circumstances equal. Perhaps Mrs. Clinton’s most impressive attribute is her ability to withstand criticism — and often emerge the stronger from it. If she runs for president again, she will surely receive plenty of it.